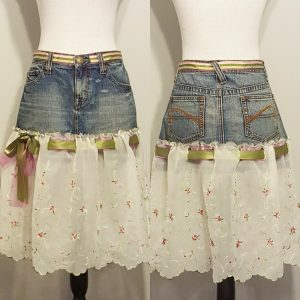 Although a classic, why wear a plain denim skirt when you can rock one with one of a kind details and embellishments? 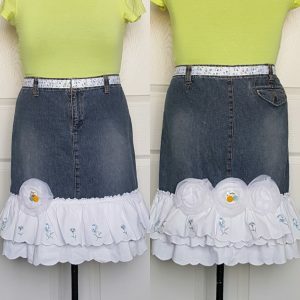 Here are a few upcycled into fresh pieces for spring and summer 2018. 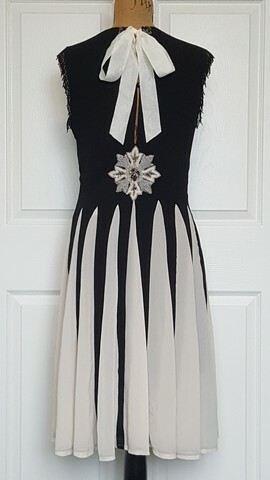 When I found this dress, it just screamed 1920’s to me! I have had it in my raw materials stash for awhile now, waiting for further inspiration to strike and the right accoutrements to show themselves. On a recent trip to a unique and special fabric store ( www.darrellthomas.com ), I found an amazing cotton fabric that was printed with panels featuring ladies of the 1920’s. There were ten different panels in all before the pattern starts its repeat. The images, colour palette and quality of the fabric all added up to – I have to have some of this….and, I know exactly what I am going to do with it!!! 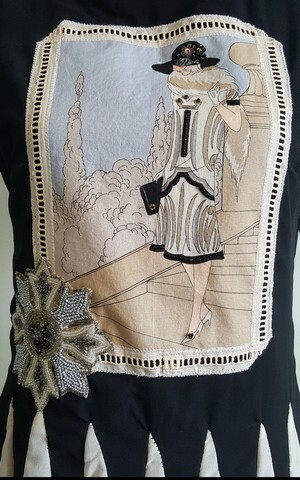 I knew immediately that the fashions, hats and other accessories that the ladies were wearing in each panel would be perfect for embellishment with beads, sequins and other sparkly bits. 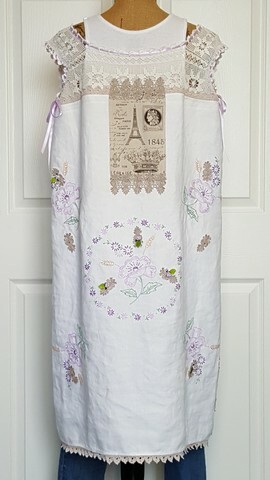 I could make them come to life with added detail and texture, not to mention providing unique flair to the garments to which each panel would be appliqued! 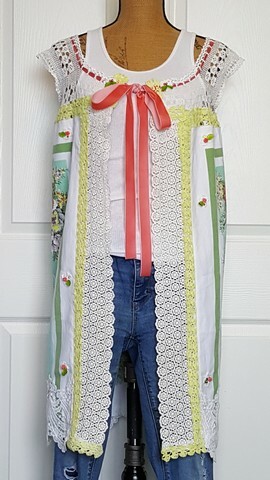 The elastic loop for one of the center back button closures was missing when I purchased the dress so I decided to do away with it all together in favour of adding a raw silk bow as a new and much more saucy closure. 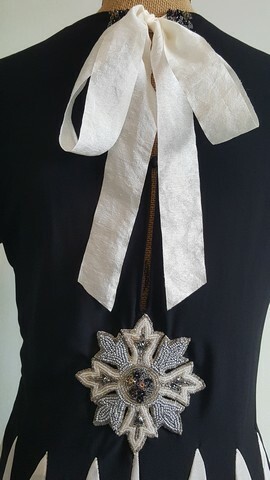 The second button further down the center back of the dress was changed from plain black plastic to one with a bit of sparkle, which still closes with an elastic loop. 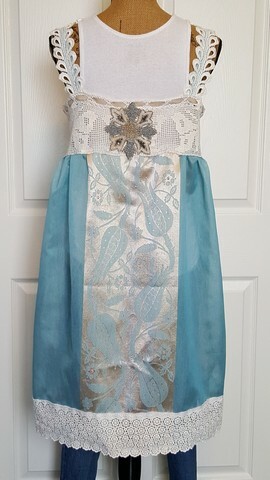 I also chose to use another fabulous flea market find, two beaded motifs in shades of muted silver and gold, to accent the back and front of the dress to bring in even more of that jazz era bling to the dress design. This dress was inspired by Zelda Fitzgerald, the wife of The Great Gatsby author, F. Scott Fitzgerald. Dubbed by her husband “the first American flapper, she was renowned for her beauty, fashion and high spirits and was also a novelist and painter. 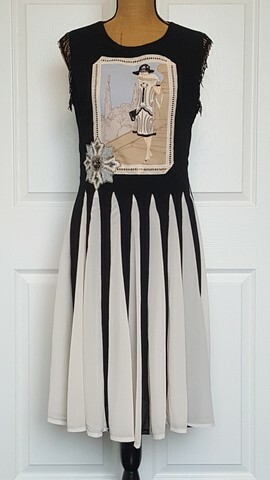 Just putting this dress on, makes you feel feminine, sassy and ready to Charleston the night away at a 1920’s themed wedding or event. Perhaps with even a few feathers in your hair to complete the effect! 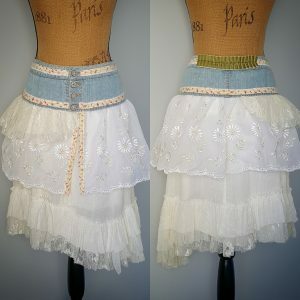 It may be snowing and blowing out there to the point where flannels, a cozy throw and hot cup of tea on the couch are the only way we can even fathom making it through the winter but, it is also that time of year where we clothing artists need to start thinking about and working on our spring collections. I have been doing more than just thinking about it. 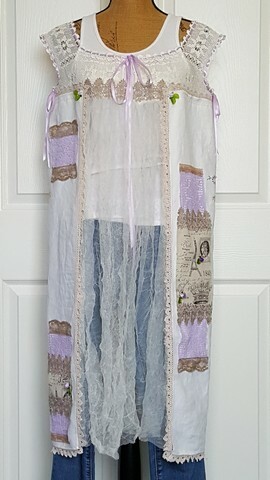 I have completed three new pieces using some vintage crocheted lace bodices, linen tablecloths and unique laces of old. Each of these pieces has been styled by me to be worn of over a tank top with a favourite pair of jeans and sandals or flats. 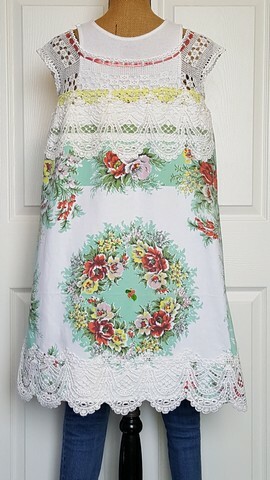 They would be equally feminine and even more the statement piece worn with a simple summer slip dress. 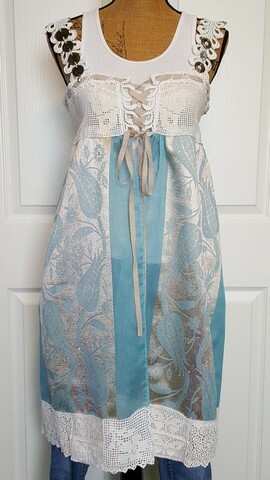 I am not sure whether to call the style a tunic, coat dress, long vest or just simply, a wearable art topper. 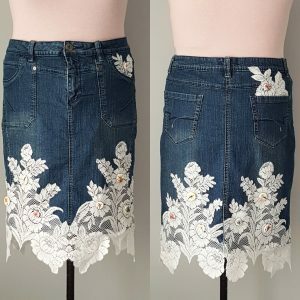 I do, however, know that each design is one of a kind as the textile items used to create them cannot be duplicated and my usual attention to embellishment and detail has been lovingly applied to all. I had a wonderful time making each of these lovelies and would love to make a few more but, alas, I have no more of these bodices left. Time for a treasure hunt for more!! !